Figaro Nautisme covered one of our study on sea stars 'des étoiles de mer aux bras armés'. Sylvain Pincebourde joined the scientific bureau of the INRA network EpiArch (Epidemiology and Architecture) which looks at the epidemiological processes including the development of insect pests in plant canopies. Sylvain Pincebourde is now a member of the Editorial Board of Oecologia. David Giron is now a member of the Editorial Board of Journal of insect physiology and Journal of chemical ecology. Llandres, A. & J. Casas (2014). Indirect cues in selecting a hunting site in a sit-and-wait predator, in press Physiological Entomology. A movie on our work on small scale mechanics of insect life, produced by the CNRS and directed by Claude Julie Parisot will most likely be hosted on the main page of the Society of Integrated and Comparative Biology (SICB) very soon. 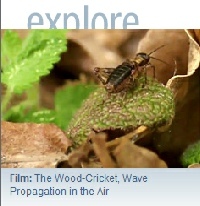 The movie « The Wood-cricket, wave propagation in the air » is hosted on the main page of english web site of the CNRS. Our website will experience a complete renewal early 2017. So stay tune if you want to read more on our group, as well as specifically about the latest on insect ecomechanics and bioinspired technologies!